Gustavo Acosta: Ciudad con Vista al Mar | Miami Center for Architecture & Design, Inc. The Miami Center for Architecture & Design is proud to present Ciudad con Vista al Mar, a recent large-scale work by Gustavo Acosta, in the center’s project gallery. Born in Havana and currently living in Miami, the artist’s work often addresses the connections between the two cities, particularly at the urban level. This work, first presented at the Panama Biennial, is part of a series of works titled “There,” which uses the medium of painting to strip away the romance and exoticism that is often attached to his hometown. 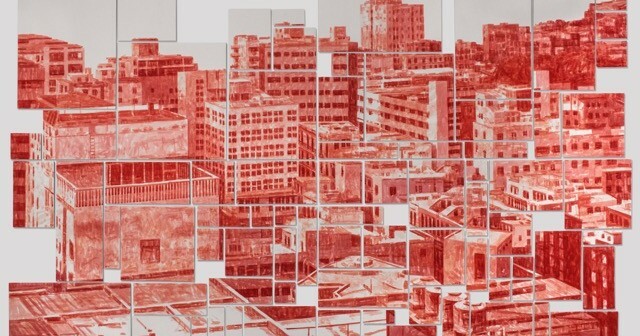 This painting is unique in the series, as it is the only multi-panel work among the group; made from discards of frames and red watercolor, the puzzle-like composition turns a downtown vista in Havana into an anonymous skyline. This project gallery exhibition is curated by Ricardo Mor. Special thanks to the artist and Pan American Art Projects for making this exhibition possible. When I consider the term “City with Ocean View”, my first thought is of a hypothetical real estate advertisement. But, a city cannot be sold like an apartment, a building or a plot of land. To think of this concept in visual artistic terms, it creates an ironic strategy of a supposed commercialization or a cited transaction. 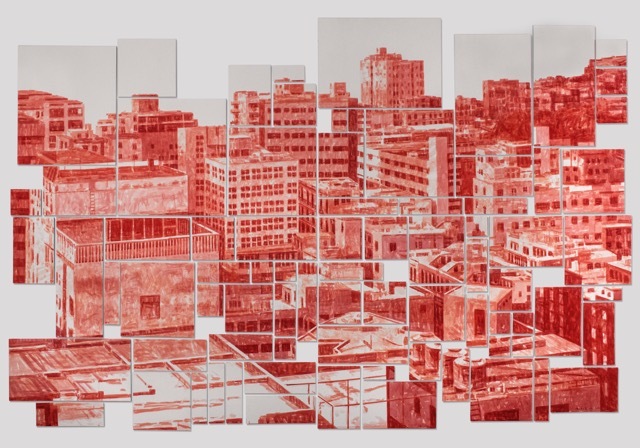 The city which is the protagonist in this work is Havana, presented in this case like a puzzle or model to be assembled. I created this piece in 2013 specifically for the First Biennial of the South, Panama. It was the most ambitious work from a series that I began two years earlier in which presents a multi-focal urban experience. In this work, I changed my strategy and chose to concentrate on a single disjointed image which needed to be constructed, while simultaneously understanding the particulars. The image is contemporary, yet the scene is Republican, based in the last decade of the Republic of Cuba. The selection of the space is central, as I had to avoid as much as possible, architectural icons and archetypes which make a city immediately identifiable, while at the same time drawing attention to the vitality of a systematically ignored period in the visual references of Cuba. Hypersaturaded in exoticism, and the many epic preconceptions of the historic and romantic city. Cuando me enfrento al termino Ciudad con Vista al Mar, lo primero en que pienso es en el anuncio de una hipotéticatransaccióninmobiliaria. Pero una ciudad no se vende como un apartamento, un edificio o un área determinada,al pensar esta circunstancia como obra visual se establece de hecho una estrategia irónicaque presenta la supuesta mercancía o la citada transacción. La ciudad que protagoniza la obra es La Habana, en este caso presentada como un rompecabezas o modelo para armar. Realice esta obra en 2013 para participar en la Primera Bienal de Sur, Panamá. fue la mas ambiciosa de una serie comenzada dos años antes donde proponía un registro multifocal de la experiencia urbana. En este caso cambie la estrategia y me concentre en una sola imagen desarticulada que exigiera el proceso de construirla, construirla como sinónimo del proceso de entender y comprender sus particularidades. La imagen es contemporánea pero el escenario es republicano, principalmente de la ultima década de la Republica de Cuba. La elección del área es vital ya que evite y evito siempre que puedo, los iconos arquitectónicos y los arquetipos que hacen a determinada ciudad un ente reconocible a la vez que llamo la atención a la vitalidad de un periodo sistemáticamente ignorado en las referencias visuales de Cuba, sobresaturadas de exotismo, epica y preconceptos de ciudad histórica, romántica y muchos etc.